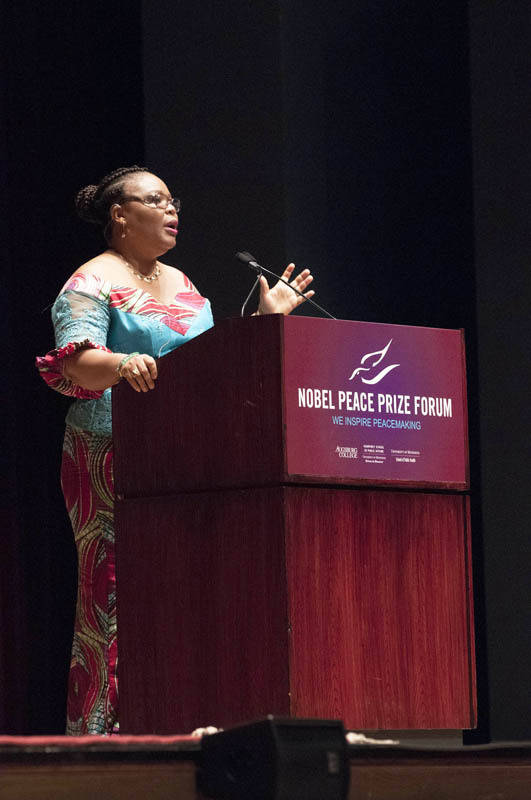 Planners of this year’s Nobel Peace Prize Forum, hosted by Augsburg College and the University of Minnesota, took full advantage of electronic technology to connect with peace-lovers across the globe. Plenary sessions and special-interest sessions featured connectivity with students and other interested participants in 41 countries, in locations as diverse as Norway, Africa, and Japan. In a workshop exploring the phenomenon of “crowdsourcing” — using the best efforts of widely-scattered volunteers to do scientific research for peaceful purposes — resource speakers in Copenhagen and Oxford contributed their expertise via the Internet, sharing PowerPoint slide shows from overseas. Anyone with live-stream capabilities on his or her computer could view any of the sessions in real time. On the following weekend, three more themed days explored peace issues related to Law and Business (March 7), Science and Health (March 8), and Global Concerns (March 9). Keynoters addressed large crowds at Ted Mann Concert Hall on the U of M’s West Bank campus. Strand explained that Scandinavians see a company’s stakeholders to be both employees and shareholders. Foege believes the tipping point in global health came in the year 2000. The credit, he says, goes to Melinda and Bill Gates, whose foundation has led the way in promoting and financially supporting global health. Foege had harsh words for those who use misinformation to spread fear in the population, retarding good health outcomes. He was particularly scornful of the pseudo-scientist who wrote in The Lancet, the British medical journal, that there was “a good chance” that inoculations could lead to autism in children. “[This man] has done more damage to global health than possibly anyone else,” Foege maintained, arguing that the results of such misinformation are notoriously difficult to undo. He suggested that autism is probably caused by something before birth, not after. 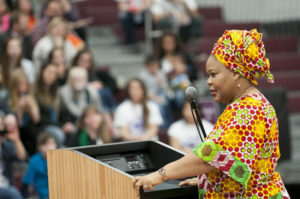 Keynoting Global Concerns Day was Liberian peace activist Leymah Gbowee. The 2011 Nobel Peace Prize winner appeared in the colorful African dress that is her trademark when addressing audiences. She explained that her unusual attire has at times caused her more than a little inconvenience — sometimes with amusing outcomes. 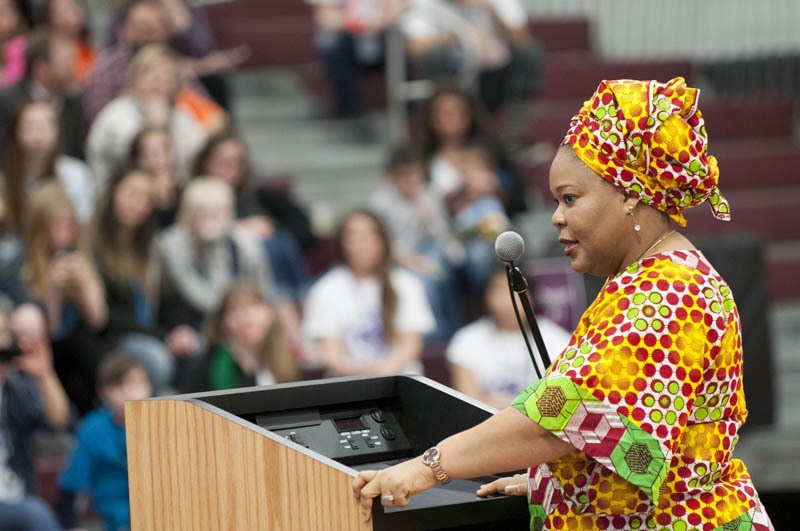 Liberian Lutheran Leymah Gbowee’s keynote brought the Nobel event to a conclusion. She called for “ordinary citizens of the world” to become “ordinary peacemakers.” Reflecting on her experience, helping to get armed enemies to lay down their weapons and make peace in Liberia, she told how the mothers of boys, teenagers, and young men who had become mercenary soldiers made peace with their children. Said Gbowee, “The good people of this world have stepped back and allowed the minority with evil intentions to take over. It is high time for people of good will to step forward and set things right again.” Until we step out with courage, she said, evil people will come and occupy our space. Other keynoters at the conference included Sister Helen Prejean, an activist against the death penalty; Dr. Ian Bremmer, president and founder of The Eurasia Group; and Deane Marchbein, M.D., director of Doctors Without Borders (Medecins sans Frontieres). 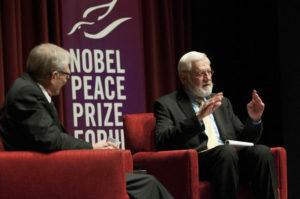 The Nobel Peace Prize Forum is hosted annually on the campuses of Augsburg and the U of M. Sponsoring institutions are the six U.S. Lutheran colleges and universities with Norwegian heritage — Augsburg, St. Olaf, Luther, Augustana (Sioux Falls), Concordia (Moorhead), and Pacific Lutheran University.